My thanks to my contacts at Pegasus Books, Iris Blasi, Katie McGuire, Maia Larson, and new, to me anyway, Bowen Dunnan—for my advance reading copy of this book. Thanks so much! Agatha Christie has the honor of being the best selling detective fiction author. Her characters of Hercule Poirot and Miss Jane Marple are known the world over. Her works are translated into many languages and have spawned movies and television shows. 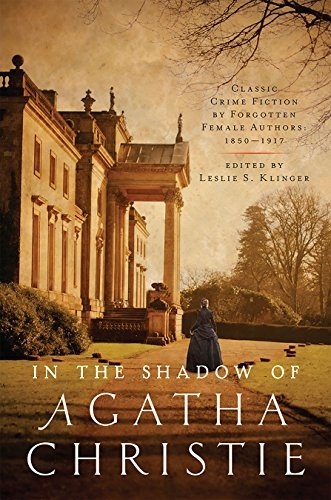 This is the story of some women authors of detective fiction that perhaps never had the success Christie accomplished, but were excellent writers with solid characters. This volume is dedicated to sharing their detectives and villains with a modern audience. The characters are not all strangers to me, but that is partially due to my reading habits. More stories about many of these characters can be found in the two Rivals of Sherlock Holmes novels. Baroness Orczy’s The Old Man in the Corner plays constantly with a piece of string while relating his tales to the Lady Journalist. Elisabeth Corbett’s Dora Bell is an undercover investigator. LT Meade and Robert Eustace combine to bring us Madame Sara, a lady criminal also known as The Sorceress of the Strand. There is CL Pirkis’ Loveday Brooke, Augusta Groner’s Detective Joseph Muller, Anna Katerine Green’s Violet Strange and many more. The tales in this book are told from many viewpoints and I would recommend most of them without a second thought! There’s a particularly hilarious tale of “The Society of Infallible Detectives” by Carolyn Wells that is sure to delight any mystery reader. Best in Book this time is a tie between The Blood Cross by LT Meade and Robert Eustace and The Regent’s Park Murder by Baroness Orczy. The story I enjoyed the least is The Winning Sequence by ME Braddon—it is a ghost tale with an explanatory mystery that fails on both. I hope to see more volumes of lesser-known sleuths from past years! I am more than happy to give this book five stars! The Blood Red Cross by LT Meade and Robert Eustace is an adventure with villainess Madame Sara, the Sorceress of the Strand… Tie for Best in Book! The Regent’s Park Murder by Baroness Orczy is a tale of The Old Man in the Corner… Tie for Best in Book! The Adventure of the Clothesline by Carolyn Wells is the hilarious story of the Society of Infallible Detectives many of whom the reader will instantly recognize… Funny!